If you are a northern gardener seeking a perennial vine for a shady area, you should be very careful about the one you choose. Shady areas are naturally challenging for all plants, and so those that grow well there have adapted to be quite tenacious. They may be so tenacious that they have become an invasive plant. In some regions, invasive vines such as kudzu pose severe problems for forests and landscapes. 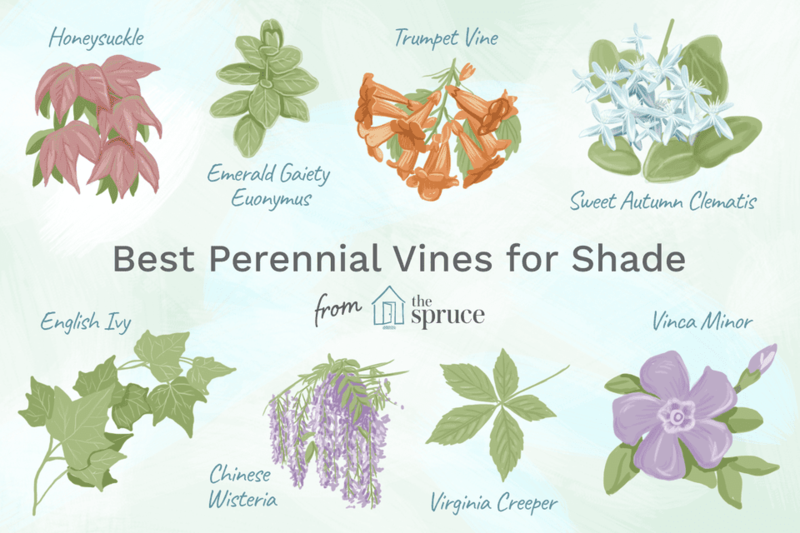 The following list gives some recommendations for both perennial vines that tolerate partial shade, as well as some to avoid due to dangers of invasiveness. Some you may want to try, but you should do so with caution. Boston ivy is not grown for its flowers. It is the foliage of this traditional favorite that earns it a place on this list. "Ivy League" colleges are so named because the external walls of some of the older buildings on their campuses are covered in Boston ivy. The leaves of Boston ivy (pictured) can become a brilliant red in autumn and is attractive in summer, too, when it is a deep glossy green. Fall color is best when this vine receives ample sunshine, so if you are growing it in the shade, you need to be content with its summer look. As difficult as it can be to find vines to grow in the shade, it is even more difficult to find specifically flowering vines that bloom well under shady conditions and that are hardy in the northern states of the U.S. (as well as some parts of Canada). Because climbing hydrangea meets these requirements, it is one of the most valuable plants at the landscaper's disposal. Although Virginia creeper makes the "good" list, it has some qualifications. As a vigorous grower, it is not suitable for growing in small spaces. 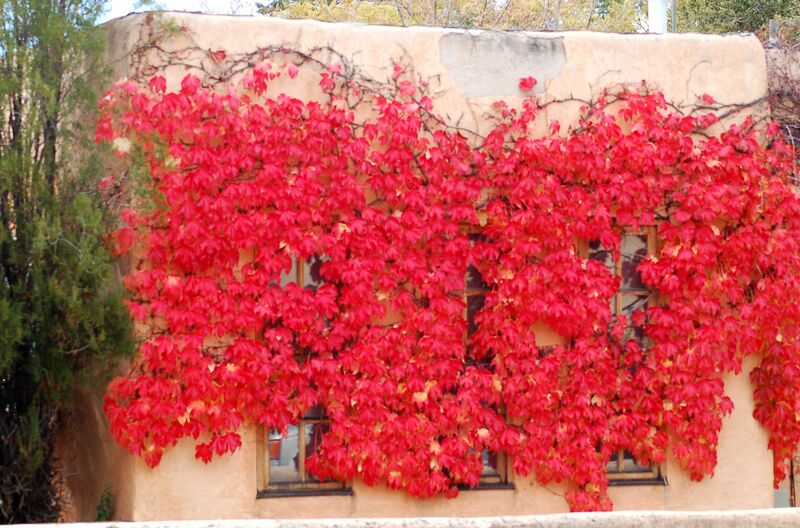 Plant developers have produced somewhat tamer cultivars for homeowners to grow, such as "Red Wall." Like its relative, Boston ivy, the fall foliage of Virginia creeper can be outstanding. (Boston ivy and Virginia creeper are both members of the Parthenocissus genus). Do not expect optimal color in fall if you grow it as a vine for shade. Periwinkle (Vinca minor) can be invasive in some circumstances, but it is relatively easy to control in the landscape. It can be one of the good plants to grow under trees—a particularly challenging environment. Vinca is a drought-tolerant groundcover, which means it can accommodate large trees consuming most all of the available water. Unlike the other plants listed here, periwinkle is not a climber. But those who do not mind its aggressiveness will appreciate its ability to fill in an area that would otherwise become overrun with weeds. The pretty, violet-blue flowers that it produces is another noteworthy trait. Chinese wisteria (Wisteria sinensis) is also invasive in some regions of North America. A better choice for most American gardens is Wisteria frutescens, an American native. The problem with the American variety is that it does not flower in the shade. Chinese wisteria, on the other hand, flowers beautifully in the shade, but gardeners risk dealing with its potential invasiveness. Are the risks worth it? Only you can answer that question. Sweet autumn clematis (Clematis paniculata) is a vine that grows well, and flowers well, when planted in the shade. But reviews on this plant are mixed. Some people love sweet autumn clematis and the delightful scent that it emits during the evening. But others are annoyed that the plentiful flowers—so beautiful to many—are the source of equally numerous seeds that will germinate all over the garden to produce seedlings. If you value low-maintenance landscaping, then you are on notice that you will be pulling up these unwelcome volunteers for an eternity. For gardeners who do not mind weeding chores, it might be a perfect vine. Trumpet vine (Campsis radicans) is another plant that is not without its merits. It will eventually produce its gorgeous orange flowers even in partial shade, and the hummingbirds adore it. But unwanted "children" from the parent plant will pop up everywhere, and they are much harder to pull up than sweet autumn clematis plants. This vine is a thug that some people come to despise. "Emerald Gaiety" euonymus is a foliage plant that can take the form either of a vine or a shrub. Consequently, it can be grown either as a groundcover or as a hedge plant (pictured). It is easy to pick out Emerald Gaiety. It has variegated leaves in a green and white pattern. Shade does not bother it much, but its potential for invasiveness might prove to be a bother for you. For some gardeners, English ivy competes with Oriental bittersweet and kudzu for the title of the most hated vine in North America, due to its invasiveness. This vine is not recommended, even though it grows very well in the shade. Gardeners Speak of "Invasive" Plants All the Time, but What Does That Really Mean? Japanese honeysuckle (Lonicera japonica) is an attractive perennial vine for shade—but the rampant invasive nature of this exotic makes it a plant to avoid at all costs. The honeysuckle variety native to the eastern U.S., Lonicera sempervirens, is, unfortunately, not a vine for shade. Incidentally, although the common name for Lonicera sempervirens is "trumpet honeysuckle," do not confuse it with trumpet vine (Campsis radicans).